The success of several new parties with a broadly nationalist agenda has prompted some authors to speak of the rise of a ‘new nationalism’ in European politics. But what is new and what is nationalist about Europe’s ‘new nationalism’? Daphne Halikiopoulou argues that while the rhetoric of these parties is indeed centred on nationalism, the drivers of support are neither new nor necessarily nationalism-related. What is new is the ability of far right parties to seize the opportunities created by economic and political insecurities using ideological rather than biological justifications of national belonging, thus successfully appealing to mainstream voters. Far right parties are on the rise across Europe. While these parties differ in many ways, it is their shared emphasis on sovereignty and policies that promote a ‘national preference’ that has facilitated the term ‘the new nationalism’. In other words, the shared ability of these parties to mobilise support by advocating strict immigration policies, Euroscepticism and policies that place the ‘native’ inhabitants first in a range of areas including welfare and social services, points to the importance of nationalism in understanding this phenomenon. But while the rhetoric of these parties is indeed centred on nationalism, the drivers of support are neither new nor necessarily nationalist-related. There is a much more complex mechanism at play involving three factors in particular. First, there is an economic argument about insecurity and the risks and costs of economic hardship facing both labour market insiders and outsiders; second, there is a political argument about the loss of trust in institutions, state capacity and the ability of the state to deliver on its social contract obligations; and third, there is an instrumentalist argument about nationalism as a ‘supply-side’ factor, a strategy used by parties in an attempt to broaden their appeal by presenting themselves as legitimate to large sections of the population. Nationalism-related explanations of far right party support are twofold. One set focuses on ethnic competition, arguing that the fear of loss of cultural identity, a perceived incompatibility between cultures and the inability of certain groups to assimilate drives people to vote for the far right. The second set is broader. It understands the rise of the far right as a value conflict, a reaction to value change. Neither explanation is without its limitations. First, there isn’t always a correlation between immigration levels and far right party support. Second, it is not clear that ‘cultural’ indicators including anti-immigrant attitudes, distrust of global governance, mistrust of national governance, authoritarian values and left-right ideological placement are necessarily cultural. For instance, perceptions of immigration are closely linked to labour market outcomes including jobs and wages; welfare provision including health, pension and benefits; as well as pressures on infrastructure and the ability of the state to deliver on social services. Distrust of global and national governance need not necessarily be value-based. They may be directly related to crisis management and could be the product of particular policies. There is, therefore, a false dichotomy here. The distinction between socio-economic and cultural explanations is not clear-cut. An important question to ask is where attitudes and values come from. And the answer is, to a great extent, structural socio-economic factors and policies. This explains why certain socio-economic characteristics, such as low levels of education, for example, are common to the profile of the far right voter. This brings me to my first argument about economic insecurity. 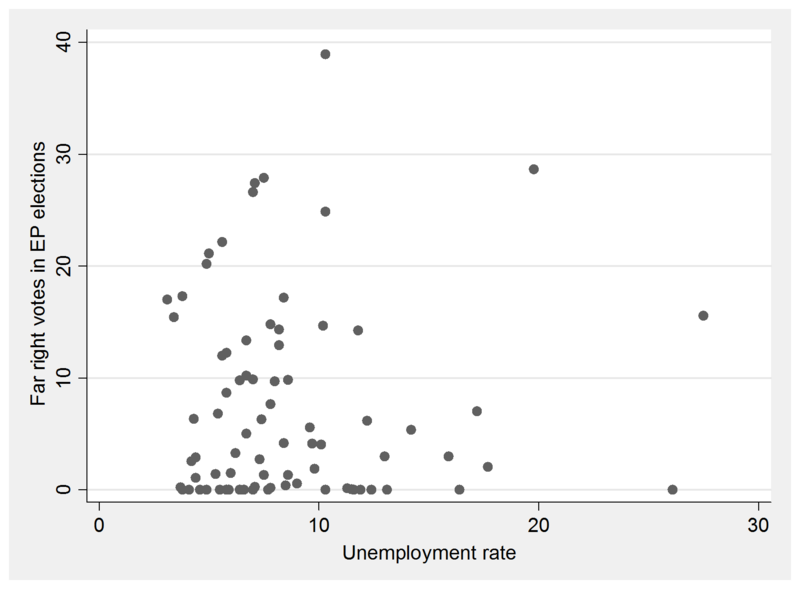 There is indeed very little correlation between unemployment and far right party support. This does not mean, however, that the economy does not matter. The relationship between economic distress and far right party support is in fact a complex one and conditional on labour market institutions. A more nuanced picture shows that the extent to which economic insecurity may be mediated by labour market institutions does matter. In previous collaborative work with Tim Vlandas we have shown that it is specific labour market policies rather than the economic crisis itself that are more likely to facilitate the rise of the far right. What matters is the extent to which these policies mediate the risks and costs of unemployment and economic malaise more broadly. 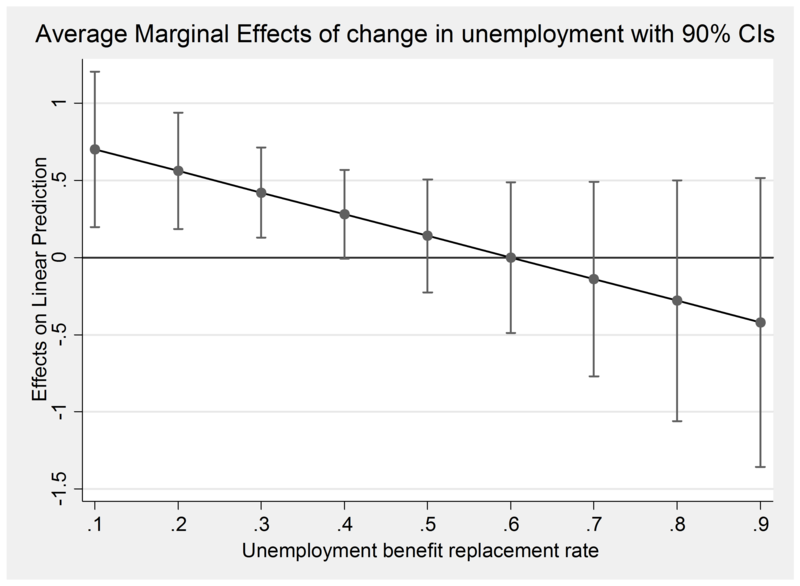 Where labour market institutions offer greater protection from the risks and costs of unemployment, the far right is less likely to fare well electorally. Where, on the other hand, these institutions are less generous, the risks and costs of unemployment are greater and the far right is more likely to increase its support. It is worth noting here that economic insecurity is not only an argument about the haves and the have-nots, the unemployed, or the working class. It is an argument about the extent to which deteriorating economic conditions may have a negative impact on the expectations and/or the socio-economic status of both labour market outsiders and insiders, i.e. a broad range of social groups, including the middle classes. 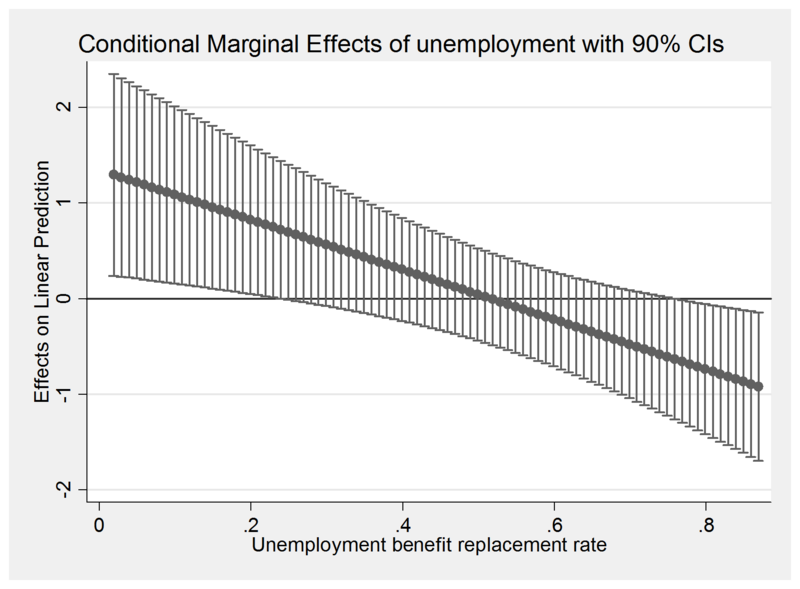 Unemployment may increase insecurity and hence lead to higher levels of far right support through two conceptually distinct channels: because it imposes costs on the unemployed and because it increases the risks for those that are employed. For example, in Greece those who have suffered from austerity are not only the marginalised sections of the population – i.e. the outsiders – but also the large middle classes – i.e. those insiders who found themselves much worse off. This brings me to my political argument. The inability to mediate economic insecurity raises issues of governability, which result in the disenfranchisement of the middle classes. The perceived inability of the state to limit the socioeconomic impact of the crisis on individual citizens results in a loss of trust in governance and democratic institutions. In turn, this perceived breach of the social contract opens space for smaller, often extreme, parties that offer an alternative vision of representation. 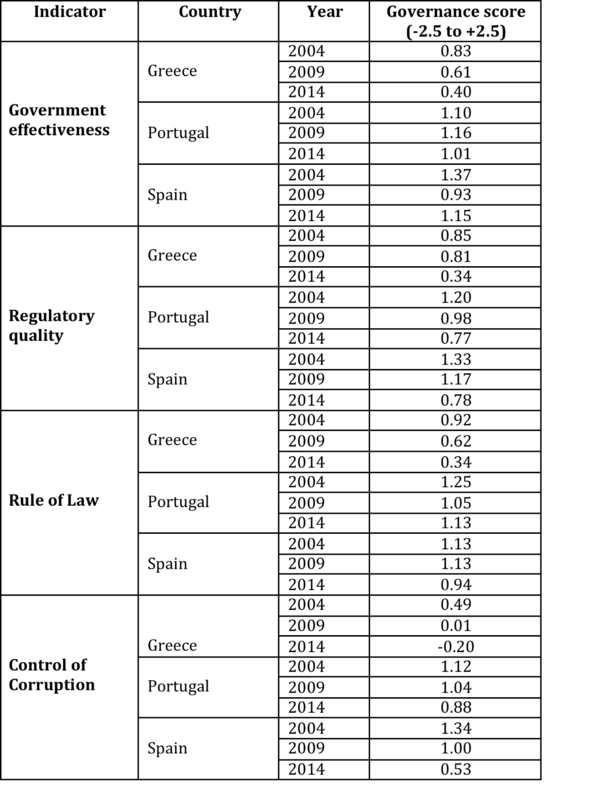 In our work with Sofia Vasilopoulou we have shown this through a comparison of Greece, that has a successful far right party, and Spain and Portugal, which despite also having experienced the severity of the European economic crisis, do not. Our comparison indicates that one of the major differences between the three countries is the extent to which the crisis triggered the breakdown of the political system itself because of the perceived limited ability of the state to address the crisis. We measured this through the use of a number of indicators that measure trust, good governance and the perceived efficacy of the state. 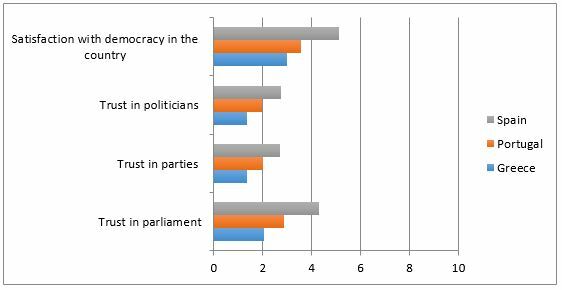 Our findings suggest that far right parties are more likely to experience an increase in their support when issues of governability impact upon the perceived ability of the state to fulfil its social contract obligations. To recap, economic insecurity on the one hand and perceptions of state capacity and the ability of the state to deliver on its social contract obligations on the other both need to be taken into account in our explanations of what drives support for the far right. But what is then the role of nationalism? This brings me to my third argument. What nationalism does help explain is supply: it provides a rhetorical tool, a strategy for attracting voters and justifying policies. Our work with Sofia Vasilopoulou and Steven Mock has shown that the European far right parties that are most successful are those who are able to tailor their discourse to the liberal and civic characteristics of national identity so as to present themselves and their ideologies as the true authentic defenders of the nation’s unique reputation for democracy, diversity and tolerance. Far right parties offer ‘nationalist solutions’ to a range of socio-economic problems that are driving voters. Although they are exclusionary by nature, this exclusion is no longer justified solely in ethnic terms, but rather is targeted at those who do not share ‘our’ liberal values such as democracy, multiculturalism and the rule of law. These parties present ‘our’ nation as one of tolerance, liberalism and diversity threatened by an influx of intolerant, reactionary and narrow-minded ‘others’. ‘We’, they argue, do not exclude on the basis of race but on the basis of toleration, i.e. those who reject ‘our’ liberal democratic values. Instead of, therefore, justifying their positions on ascriptive, exclusionary, immutable criteria of national membership such as race and common descent, which is what fascist parties did, the ‘new’ far right increasingly uses ideological justifications thus increasingly occupying mainstream ground. To conclude, behind attitudes and values are political and socio-economic factors that drive demand for far right parties. In this sense the ‘new’ nationalism has much in common with the ‘old’, arising at a time of heightened insecurity and lack of trust in the ability of the state to deliver on its social contract obligations. The role of nationalism is in the supply: the attempt and ability to seize the opportunities created by economic and political insecurities through an appealing rhetoric that is careful to distance itself from ‘race’ and focus instead on values and voluntaristic criteria of national membership. What is new is that the adoption of ideological rather than biological justifications of national belonging blurs the boundaries between what is ‘far’ and what is mainstream. In utilising this rhetoric, these parties are increasingly able to permeate the mainstream ground and drive party competition. And this is precisely what makes them more dangerous. The ‘new’ nationalism is no longer simply the privilege of the far right. Note: This article gives the views of the author, and not the position of EUROPP – European Politics and Policy, nor of the London School of Economics. Featured image: nrc.nl. Daphne Halikiopoulou is Associate Professor in Comparative Politics at the University of Reading. She is author of The Golden Dawn’s ‘Nationalist Solution’: explaining the rise of the far right in Greece (with Sofia Vasilopoulou) and numerous articles on far right parties in Europe. She has received an award from the American Political Science Association for her work on labour market institutions and far right party support. She is an editor of the journal Nations and Nationalism.